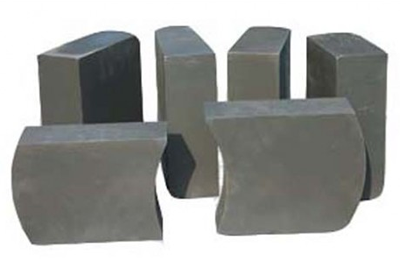 Material and Technique: Magnesia-Carbon brick is resin-bonded brick made from dead-burned or fused magnesia and graphite. Anti-oxidant is added if required. Properties: Magnesia-Carbon brick has good performance in thermal resistance, corrosion resistance, and spalling resistance. Properties: Alumina-Magnesia-Carbon brick has appropriate residual expansion, low thermal conductivity, and better insulation performance than that of Magnesia-Alumina Carbon brick. Magnesia-Alumina Carbon brick has the performance between that of Magnesia-Carbon and Alumina-Magnesia-Carbon. KT Refractories distributes Magnesia Carbon Bricks, Magnesia-carbon brick, a wide range of Magnesite Brick, Burned Magnesite brick, Fused Magnesite brick, Magnesite Alumina brick, Magnesite-Alumina Spinel brick, Magnesia-Chrome brick, Direct-Bonded Magnesite Chrome brick, Rebonded Magnesite-Chrome brick, Semi-Rebonded Magnesite-chrome brick, Magnesite Dolomite Brick, and MAGNESIA-SPINEL brick of the best quality at the most competitive prices worldwide. Specifications and data sheets are available upon request. Call 1-877-365-2995 to order Magnesia Carbon Bricks, Magnesia-carbon brick, Magnesite Brick, Burned Magnesite brick, Fused Magnesite brick, Magnesite Alumina brick, Magnesite-Alumina Spinel brick, Magnesia-Chrome brick, Direct-Bonded Magnesite Chrome brick, Rebonded Magnesite-Chrome brick, Semi-Rebonded Magnesite-chrome brick, Magnesite Dolomite Brick, and MAGNESIA-SPINEL brick. Our fast, responsive customer service and reliable delivery service will save you time and money!